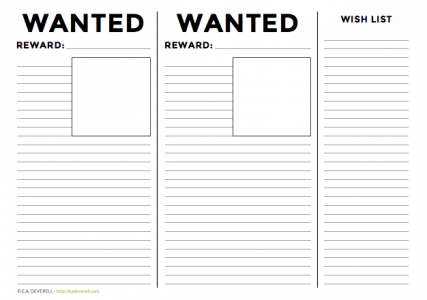 This week’s worksheet is a wanted poster for anything you want from the universe. A novel with your name on it? Describe whatever you want in as much detail as possible. If someone sees this thing, they need to be able to recognise it so they can bring it to you. And you need to recognise it when it shows up! So be specific. And don’t forget to set a reward. What will you give in exchange? A slice of your signature cake? Your second favourite teddy bear? What’s this thing you want worth to you? P.S. You can also draw or paste in a picture for extra effectiveness. Don’t forget to follow me on Instagram to see how I fill in my #writingjournalchallenge worksheets!